This supposedly is the original Caesar salad recipe from Chef Caesar’s daughter Rose Cardini. It is so delicious you won’t believe it was first created out of whatever the chef had left in his kitchen! This salad is such a rich and delicious salad recipe you will make it over and over again. Fry bread cubes in some of the olive oil, as needed. Toss until crispy and golden. Set aside to drain on paper towels. Crush the garlic cloves and salt into a paste in a large wooden salad bowl, using the back of a wooden salad serving spoon. Add the anchovies and do the same. Add the Worcestershire sauce, dry mustard, lemon juice and pepper. Whisk in the remaining oil until thoroughly combined. Add the grated Parmesan cheese and whisk again until combined. Add the shredded lettuce and toss thoroughly. Add the coddled eggs and toss until the lettuce is coated with the egg. Top with shaved or shredded Parmesan cheese. Serve. Put a whole egg (in the shell) in a saucepan of room temperature water. Bring the water to a simmer and simmer for 1 minute. Drain and cool the egg immediately by running cool water over it. It will be soft and the white still runny. Adding the eggs is optional but oh so good. The original recipe called for raw eggs and that is what used to be used in caesar salad recipes. Now though it is not recommended to eat uncooked eggs as they can contain harmful bacteria. Coddling them as shown above cooks them just enough. This recipe for caesar salad makes a great side dish with so many dinner recipes, but is also a substantial lunch salad on it’s own, served with some crunchy bread rolls. I don’t know too many people who don’t like caesar salad and it really is easy to make it from scratch. Healthier too, as you know exactly what is in it. You have to give this one a try. It’s a good diabetic recipe too. It is fairly low carb and diabetics can benefits from the healthy fats in a good quality olive oil. Like this recipe? I’d love you to Pin it to Pinterest, Tweet about it, Like it on Facebook and leave a comment and your favorite recipes below. 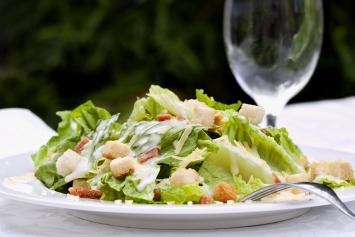 If you love this caesar salad recipe, look here for other great garlic recipes. According to what I’ve read online Cardini was opposed to using anchovies and the anchovy flavor came from the Worcestershire sauce… meaning that your recipe is not the original. Thanks, Colin. Not my information, but interesting.